Eamon Dunphy pictured at the launch of his new book in Dublin this week. The penny is dropping at last with the Irish public about Eamon Dunphy, and some people are finally starting to see the light as regards the egotistical and self-absorbed failed footballer. Dunphy has been hitting headlines of late with the same frequency he used to hit bars and nightclubs all across Dublin. And all for his own gain. He has a book to promote, a book outlining his rather pathetic life, and he will use any means, foul or fair, to promote it. He was even so outrageous as to announce during RTE television’s coverage of the Ireland-Germany game last Friday night that he was signing copies of the tome the next day in a well known Dublin bookshop – without any admonishment from his sidekick presenter Bill O’Herlihy. Now I know that the self-confessed cocaine user is seen as the beacon of greatness by many in Irish life, but the joke is starting to run out for many ordinary, decent folk. His latest antics prove it. On radio the other day he had a go at me for standing up to him when he provoked Jack Charlton into a row at a World Cup press conference in 1990. Jack took exception to Dunphy’s presence at said press conference before the Holland game, days after he had said he was ashamed to be Irish, such was the nature of the scoreless draw with Egypt. What Dunphy didn’t explain, then or in his book, is that he stopped me and many other journalists, real journalists who learned our trade the proper way and not on a lower division football pitch in England, doing our job that day. I had a supplement to fill for my employer at the time, and Dunphy’s incitement of Charlton put my job at risk. Sure he was entitled to ask a question of Jack, but real journalists acknowledge that Sunday papers -- and Dunphy worked for one at the time -- let the daily guys do their job, and then wade in. George Best’s family -- is that he came back to the press center in Italy that night and wanted to fight me. Clearly under the influence, he threatened me with physical violence and was stopped only by the intervention of the late and great Dr. Tony O’Neill, then the secretary of the Football Association of Ireland. That’s why I can never take Dunphy seriously. He wanted a row that night purely because I didn’t toe his party line at the press conference earlier that day. I did, as his book suggests, tell an English colleague to “f**k off” back to England when all hell broke out after Jack had stormed out of the press conference. What Eamon doesn’t tell you in his inaccurate book is that I apologized to Ian Ridley not an hour later and remain on friendly terms with him ever since. As a proper journalist, Ian acknowledged the pressure I was under to fill a tabloid supplement with no copy from a press conference ruined by an opinionated Sunday columnist on a Wednesday – the day before the final game in the World Cup group. Dunphy has held that World Cup rebuke against me ever since, so much so that he libelled me in a Sunday Independent column for outing the FAI as ticket touts. Again, all I was going was my job but that never matters as far as he is concerned. Everything with Dunphy has to suit his agenda. And everyone else is wrong. But what really galls me about Dunphy’s book is his condescending attitude to the late Con Houlihan, the greatest sports writer this country has ever produced. Grumpy Dunphy refers to Con in his book as a “hack,” a disgraceful description of a man who could write Dunphy under the table in just one sentence. Con’s sin was to stand up to Dunphy on Eoin Hand’s behalf in the mid-1980s, at a time when the failed footballer was already doing what he does best – picking on Irish football managers. He claims in his book that Con elbowed him in the face at a match in Lansdowne Road, a claim many of my colleagues say is utter fabrication. But all Con did on Eoin’s behalf was stand up to Dunphy, something he clearly finds unbearable as I know to my own cost. Aside from using an RTE soccer show to promote his book last Friday night, Dunphy was back to doing what he does best – firing cheap shots at Ireland managers. This time Noel King was in the firing line, the same Noel King who only took charge of Ireland for the 3-0 defeat to Germany because the FAI had seen sense a month earlier and sacked Giovanni Trapattoni. Kinger is interim Ireland boss for the time being. He has no chance of landing the job, and his only task is to mind the shop for the next man in. That’s why any criticism of the team, the tactics or the result in Germany against one of the best teams in the world last Friday night was superfluous. It was never going to make the slightest difference in the short or long term, which makes Dunphy’s bullying of Noel King all the more lamentable. Thankfully Kinger took no notice. Asked after the game if he was aware of Dunphy’s stinging rebuttal of his ability, King labeled the RTE analysis a “comedy” show and said he would his judge by the opinions of real football people and not motor mouths. Many real football people, in and outside the media, have come to King’s defense since. Many more have said it is high time Dunphy was put out to grass by RTE and their likes, and they well have a point. 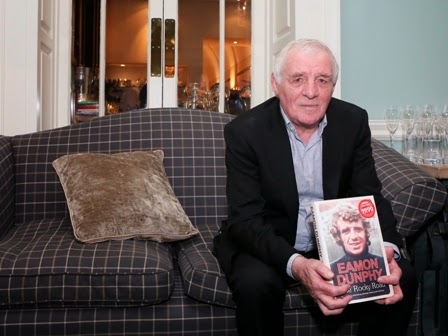 But the kernel of the issue here is that Dunphy did what he always does last Friday night – he promoted Eamon Dunphy, this time in an effort to sell copies of his new book. Anyone who buys it deserves the inaccuracies contained within. Me? I won’t even read a review copy. I’ve never liked bullies. And I’ve never liked Eamon Dunphy since the night he wanted to punch me in Palermo. I just wonder if he even remembers. Victoria course in the Algarve. Spanish golfer Gonzalo Fernandez-Castano got so annoyed with his putter in his final round of the Portuguese Masters on Sunday that he threw it into the lake. And the rust has hardly settled yet if you fancy diving in for it! GOLF: The Rory McIlroy-Horizon Sports management row hit the Dublin courts this week, and it’s going to get nasty before it gets resolved. McIlroy doesn’t come out very well from the evidence presented in the initial hearing and he really needs to get back to doing what he does best – playing golf. RUGBY: These are worrying times for Irish rugby as we await life after the golden generation led by Brian O’Driscoll. Leinster and Ulster won their opening Heineken Cup games last weekend, but the shock defeat Munster suffered in Edinburgh is of real concern to fans. SOCCER: if you’re on YouTube in the coming days, check out Liam Kelly’s goal for the Irish under-19 team against Sweden in a Euro qualifier on Saturday. A Beckham style chip from the halfway line, it has to be seen to be believed. THERE’S a great photograph doing the rounds of a young fan celebrating a goal with St. Pat’s striker Anto “Bisto” Flood as the Super Saints won the League of Ireland title with a 2-0 win over Sligo on Sunday. The look of joy on the kid’s face tells its own story and reminds us why sport is special. GIOVANNI Trapattoni again claimed he did a great job as Irish manager in an interview on Italian television on Sunday, then slagged off the lack of a real league in Ireland. He seems to have forgotten that 15 of the players he capped during his five and a half year reign learned their trade in the Airtricity League.